Spectra’s squad of seven left Leesburg unsatisfied. 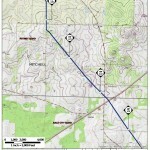 The Bell family agreed to let pipeline surveyors on their land, with strict conditions, but there was no agreement on eminent domain, and Spectra will have to come back for a jury trial about trespass in Lee County, Georgia. The judge, perhaps emboldened by the fourteen protesters, some of whom drove as much as 9 hours to get there, refused to even call the surveying agreement a consent order; it will be a consent agreement. So Spectra’s Andrea Grover got nothing they can use against other landowners. 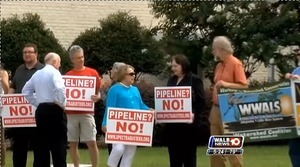 Protestors gathered outside the Lee County courthouse Thursday, demonstrating against a proposed natural gas pipeline. The company behind the pipeline sued south Georgia property owners who refused to let surveyors for the company on their land. 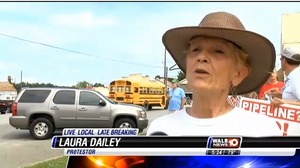 Some protesters came all the way from Florida to protest the Sabal Trail pipeline, the people behind the project say it will be good for south Georgia. 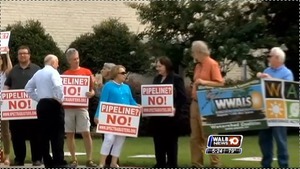 Protestors quietly stood outside the Lee County courthouse holding signs against a proposed pipeline that would come through Georgia. They say it would cut through rivers, fields, and their own backyards. “Where I come from it affects mainly the Santa Fe river which is the largest, single largest source of spring water on earth,” said Laura Dailey. “But they’re also coming through another 25 acre tract where my home sits right through my back yard,” said Sandra Jones. Spectra Director of Stakeholder Outreach Andrea Grover’s voice trotted out the old jobs claim in the WALB video, but her hed kept shaking no. And, as usual, she didn’t say who would get these jobs. The real answer is that installation crews will come from Houston. Jeb and Robert Bell say that Sabal trespassed for the surveys without permission. A settlement reached in court today makes both sides happy. Why should one family have to give up still more land for yet another pipeline? Why should eminent domain apply at all to Georgia or Florida or Alabama landowners for the profit of a private company from Houston, Texas? But some protestors want the pipeline gone. “My goal is to stop the pipeline,” said Merrillee Malwitz-Jipson. 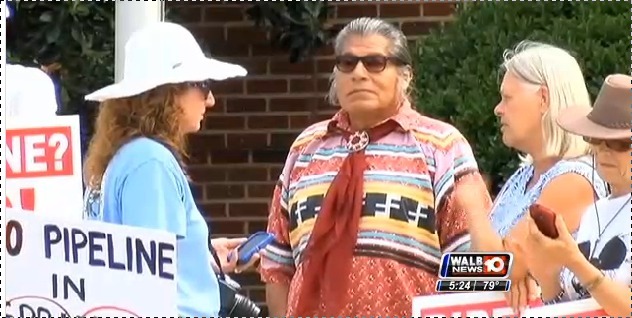 WALB can’t get into many details, and so didn’t say that she is with Our Santa Fe River. That Florida river is one of the three main tributaries of the Suwannee. The other two Suwannee tributary rivers, the Withlacoochee and the Alapaha in south Georgia and north Florida, were represented in Leesburg by WWALS Watershed Coalition (WWALS), which has the same goal to stop the pipeline. 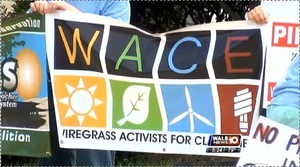 Also there with the same goal were people from Wiregrass Activists for Clean Energy (WACE), VSU’s Students Against Violating the Environment (S.A.V.E. 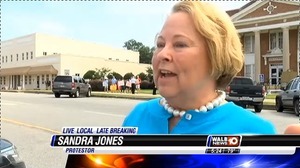 ), and the Lowndes County Democratic Party (LCDP). Two people from south Florida drove 9 hours to protest this pipeline, which would likely feed an FPL-proposed power plant in Hendry County, Florida, near the Everglades and a Seminole reservation. 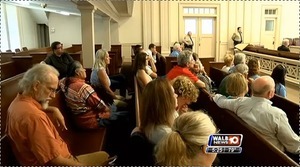 Multiple local landowners from Mitchell, Colquitt, and Dougherty Counties held signs outside and listened inside the courtroom. This is the first time most of those landowners have actually held a protest sign. Opposition the this pipeline is ramping up. Three SpectraBusters board members were outside protesting and then inside watching the hearing. 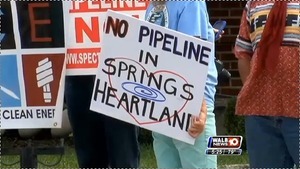 SpectraBusters, Inc. (a Georgia nonprofit) was formed to oppose this pipeline, and SpectraBusters called for this protest, in conjunction with numerous allies, which got fourteen people to show up at a courthouse picked by the pipeline company.